Thermal and chemical-thermal equipment for carbonitrile, carburizing, boriding, hardening, brazing, sintering, MIM, tempering, annealing, magnetic annealing, ageing, relieve internal stresses, etc. Laminated fabrics and space-reinforcing woven fabric. Multi-layered woven materials of silica, quartz, alkali free glasssynthetic and carbon fibers and combinations thereof. 13th Practical-research conference "Innovation Technologies of Heat Treatment"
Over 3125 specialists attended the "Heat Treatment - 2018". The exhibition is a specialized event aimed at specialists from companies-consumers of the production of this industry. The visitors of the exhibition are heads and specialists of the enterprises of metallurgy industry, oil and gas sector, aviation and space, defense, science-research, transport and gas engine sphere and from other industrial enterprises and educational establishments. Modern technologies and equipment for thermomechanical, thermochemical, dimensional and surface processing of different materials; heating furnace equipment: vacuum furnaces, arch furnaces, induction heating, electric furnaces of resistance, quenching equipment, oils and environments; equipment for plasma shape design and sputtering will be present at the exhibition. You will have an opportunity to see all the innovations and to have business talks. 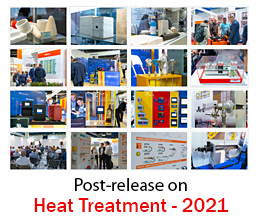 Since it was first carried out, the exhibition "Heat Treatment" has an annual positive. Many exponents are constant participants of the exhibition since the first year it was carried out. 80 companies exhibited at the past exhibitions. Among the participants of the exhibition are such well-known russian and foreign manufacturers of thermal equipment, such as: PVA TePla, Schmetz, B.M.I. Fours Industriels, Ipsen, SECO/Warwick, AFE Cronite Technologies Ltd, ALD Vacuum Technologies, Rubig, Nabertherm, SMS Elotherm, LAC, TachTech, Mesa, Mahler, Hughton, SAT Thermique, Spreafico, Fergal, Termoinduzione, SOLO Swiss Group, Sandvik etc. In 2018 80 companies from 11 countries were presented at the exhibition: Russia, Germany, Italy, Austria, China, Poland, Romania, Slovenia, France, Republic of Belarus, the USA, Switzerland.